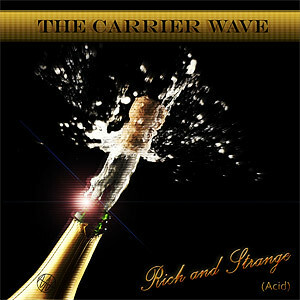 If Her Majesty The Queen listened to acid, she would listen to The Carrier Wave's new EP Rich and Strange. That might be a loaded statement, especially considering that The Carrier Wave, aka Christopher Westphal, is actually from the United States, however the sophistication and elegant restraint displayed in these 5 tracks combined with slick production and a surprisingly apropos touch of classical strings make them fit for a royal garden party or a day out on the yacht. The American President would discover this EP too eventually, though the scene wouldn't ever catch on in his country, forcing him to stay up to date on various internet forums and swap files with his online friends from across the pond, but I digress. Despite The Carrier Wave's debut EP Live Takes Vol. 1 emerging just 2 and a half months ago, Rich and Strange reveals a noticeable evolution of style as the Chicago producer combines his love for analog drum machines, modular synths, and of course, acid, with orchestral training from his earlier years. He's managed to find a unique and magical sweet spot where these things all meet because I literally cannot stop listening to it on repeat. "Funky Deschanel" opens perfectly, picking up where he left off with vintage Roland percussion at a medium pace topped with slicing pads and some really smooth 303. Before you know it however, the artist eases some upbeat violin plucks into the mix, and suddenly you're listening to acid classical electro. The integration of said strings is subtle in track one, perhaps as an intentional gesture to gradually introduce the listener to the idea and prepare them for the assault in track two. "Prim, Proper Acid" starts out like a straight-up chamber piece with an entire string section bowing out an austere melody in unison, but soon a rogue contrabass (or is it cello?) brings in a funky bassline and a swingy electronic beat follows, pushing the track into head-nodding action. The recording of the strings in this one is so clear, I swear you can hear rosin grinding on horse hair. "Bass Spatz One" is a bit of a wildcard and switches things up with even funkier acid, acoustic drum sounds and bass guitar work mean enough to turn Squarepusher's head. "Spade Cruise Lines" is a bouncy, rubbery good time that features a cool "talking" synth simply oozing with luxury, and closing track "So Long, Lefty" is truly the sound of an oceanic vessel of titanic proportions slowly disappearing on the horizon as we raise our martinis and cheers to high society black-tie acid. I love your site! Keep up that good work! I love where he’s coming from…. anyone else have good stuff to share? Especially from the north east? frankly i think the review is a little too generous with this; good debut but nothing really to catch the Queen's attention or make it to the party on the yacht.